Ted, Dougal and Jack are returning by plane from a visit to a holy shrine, where allegedly the Virgin Mary appeared on a golf course. With them on the plane are a varied assortment of nuns and priests. Ted has a great fear of flying and is very nervous when the plane takes off. Father Noel Furlong takes Father Finton Fay, a mad priest who makes monkey noises, into the cockpit. They are joined there by Dougal. 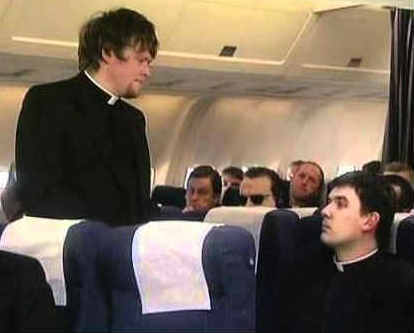 Unfortunately, Father Fintan accidentally sees his reflection and goes mad in the cockpit, covering up the pilot's eyes. The pilot tells Dougal to press the emergency button, but unfortunately he presses the one next to it and dumps the plane's fuel. Ted is informed by Dougal of the situation and Ted also becomes aware that there are only two parachutes onboard. 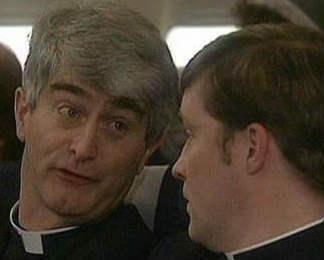 Ted comes up with a novel idea, each priest should write a 200 word composition entitled "Why I Should get the Parachute". The winners would get the parachutes and leap to safety. The compositions written by the priests range from the embarrassing to the ridiculous. All of this becomes academic when Father Jack leaps out of the plane with one of the parachutes, the other parachute being attached to the drinks trolley. All hope now seems lost. The pilot tells Ted that the plane could possibly be saved if they had some sticky tape to seal the fuel lines, but there is none aboard. The pilot is wrong, Dougal bought a novelty sticky tape dispenser at the airport. Ted's fear of flying is gone as he has a fine head when dangerous situations occur. Ted goes on to the wing of the plane and saves the day. When everything has returned to normal, Ted regains his fear and shouts, What am I doing on the feckin' wheels?! Back at the parochial house, Ted is in the living room still gripping the plane's wheels for dear life. Meanwhile, Father Jack is hanging from a tree by his parachute. The drinks trolley is also hanging, tanatalisingly just out of reach. Father Noel Furlong: Oh God! He must have seen his reflection! He's not supposed to see his reflection! He doesn't know he's a priest! Father Ted: [terrified] AHHHHHH! WHAT AM I DOING ON THE FECKING WHEELS!? AHHHH! Second appearance of Noel Furlong. Second appearance of Fintan Fay. Ted's nickname in his younger years was Father Fluffy Bottom due to a lot of downy fluff in that region. Seventh appearance of Father Larry Duff. Larry gets trampled by some stampeding donkeys at a Donkey Derby when Ted phones him on his mobile. There is a laughing blind man on the plane listening to an audio tape of Mr Bean. The joke being that Mr Bean has hardly any dialogue. Ted is reading Michael Barrymore's autobiography on the plane. Graham Linehan, one of the show's writers, makes an appearance as Father gallagher. Pauline McLynn takes two parts; one as Mrs Doyle and the other as a nun on the plane. The show's producer, Lissa Evans, is the voice of the sticky-tape dispenser.